The Dienes PQAS 1/2 knife holder with heat cut blade is offered by Dienes with the same quality and ruggedness you have come to expect from 100 years of Dienes ingenuity. The holder is designed with a fabricated steel pneumatic cylinder maintaining side wall integrity even at elevated temperatures. This holder employs the same mounting dimensions as all the Dienes PQAS style holders and can be interchanged on the same dovetail bars. These holders come standard with the same pneumatic connections Dienes offers on all PQAS style holders. Both holders are able to produce 55 pounds force when 90 PSI is applied to the holder. These holders are available with custom designed controllers feeding back knife temperature. Our controllers are capable of controlling the power to the knife, maintaining temperatures as the web speed changes. Web speeds are dependent on materials being slit and the rate of heat transfer. Dienes is happy to offer our customers slitting solution to the highest speeds and the narrowest slit widths in the converting industry. The Dienes PQAS 1/2 holder is capable of slitting down to 1/2 inch (.5 inches) slit widths whether slitting film or woven synthetic materials. This style holder allows the binding together of woven material slit edges, through a heating element. 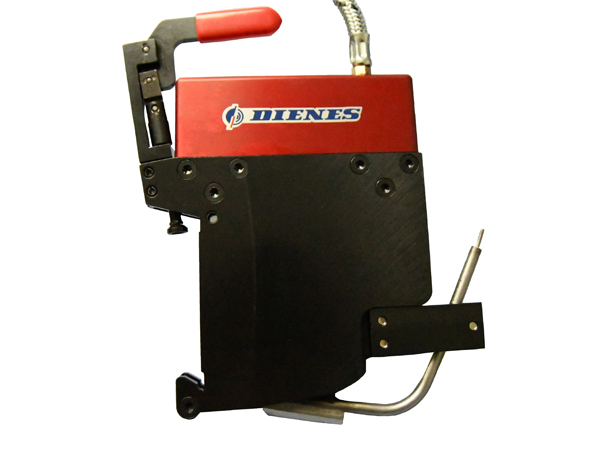 Blade heats to 750 degrees C. When you are looking for slitting know how, call Dienes.